My laptop officially has a working copy of IRAF! 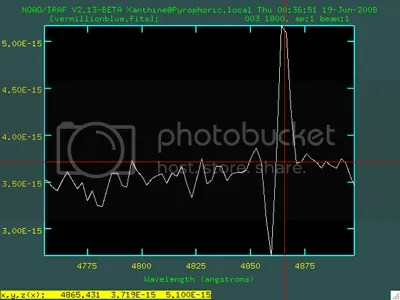 Ok, so it isn’t pretty, or particularly easy to use, but it’s pretty much essential for looking at stellar spectra. So now I can do data reduction and analysis from the comfort of my own home. Or wherever else I feel like working. Actually, this might seem like a small achievement, but it’s a notoriously difficult thing to set up on most computers — mainly because it’s an antiquated piece of unix software. So I’m quite proud of actually succeeding! In other news I’ve also managed to set up g77 (Fortran compiler… meh) and LaTeX, so my computer is fully kitted out! How cool is that? This entry was posted in astronomy, Imported from Livejournal and tagged computing. Bookmark the permalink.